Caleb Masuda L.Ac. Dipl. O.M. graduated from Five Branches University with a Master’s in Traditional Chinese Medicine. By attending both the San Jose and Santa Cruz campus, he was immersed in an environment offering additional alternate modalities and teachings from multiple approaches and perspectives. In Santa Cruz County, he worked as an intern for the Mental Health Client Action Network (MHCAN) where he treated many in the community who otherwise would not have seen a physician. His treatments have provided relief for a variety of disorders ranging from chronic pain, mood disorders, and gastrointestinal complaints. Caleb's specialties of interest stem from disorders suffered by family, friends and his own throughout his education and clinical experience. He uses acupuncture modalities based on traditional Chinese medicine while including more recent modern approaches that find their way to acupuncture's field of research as a medical technique and healing art. Caleb’s interest in the healing arts began at the age of six when he was enrolled in martial arts. He was trained in Taekwondo for six years from U.S.A. Martial Arts in San Jose California. Caleb continued training under his uncle where he learned Kenpo, Kung Fu, and Muay Thai. His interest in “Qi” derived from his background in martial arts. Through training, he learned to concentrate and focus energy for self-defense, but also for health. The concepts he learned have still served him well today. The past few decades may seem to have changed so much, but our body's function has not; to keep us balanced. Caleb's healing techniques have their foundations in utilizing one's own Qi to restore the body to a proper state. We all have it... it just might have gotten stuck somewhere. Acupuncture is an art dedicated to understanding how Qi heals the body, and how it can do harm when its function is impaired. Such as a dam full of sticks and debris, the flow may cease; in humans, this causes pain and other disorders. Pressure on the body or needles are used to remove the blockage so that the natural flow may return; hence removing the obstruction. Caleb’s interest in Qi brought him to acupuncture and its modalities, and he continues to use the skills he has accumulated over the years. In a sense, Acupuncturists are “Qi Doctors” because their modalities aim towards the body’s own Qi energy to heal itself the way the body had intended. 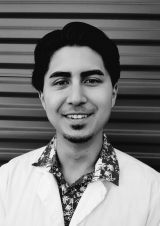 Caleb is passionate about the healing arts of ancient, holistic, and modern medicine. Watching a patient improve is his motivation in continuing his practice with healing the body and mind.